The trip started with a quick pop into British Beer Company, a franchised operation with a dozen or so locations throughout Massachusetts and New Hampshire. It’s modeled off a “traditional” English pub (scare quotes because I’ve never actually step foot in an authentic English pub). Imagine lots of dark wood and brass with comically oversized tap handles. 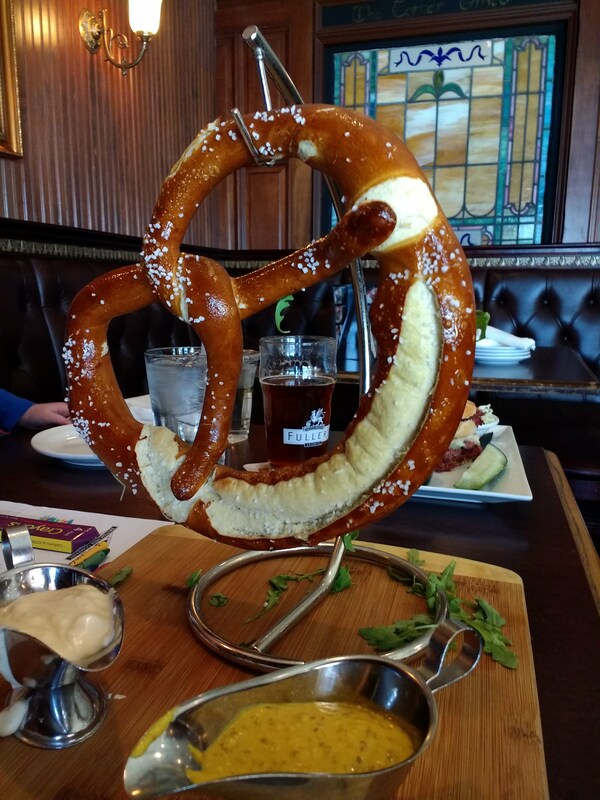 The food included some decent sandwiches and a pretzel so large it came with its own coat rack. The real star of the show, however was a delightful something-or-other from Greene King on cask. They even went so far as to offer me an imperial pint in the name of monarchical authenticity. Cask beer is often such a rare delight that I don’t even care what the particular beer is on offer, which was just as well in this case since I cant seem to find much about this particular beer. I could have sworn it was called “Extra Special” or “ESB” but attempting to research the beer online afterwards returned nothing of note. Either the largest England-owned brewery is making special one-offs to ship to a mid-sized franchise operation half a world away in Westford, or the beer was simply mislabeled. After an epic bathroom battle with Mini Mash Tun (and subsequent meltdown), we forged onward towards The Berkshires. Our ultimate destination was a rendezvous with an old college friend of ours in Northampton. As we were traveling with our entire brood, we stayed in an impressively large two-room suite at a budget motel just off I-91. Our friend (we’ll call her Barbara) came for a visit just as we got the kids to bed and we commenced with a mini bottle share. Our flight included Allagash’s Little Sal, an AWA aged in red wine barrels with blueberries, our very own Nashira, an AWA fermented in oak with peaches, and rounded out the trio with last year’s Interlude. Nashira held up admirably with the heavy hitters from Allagash. It’s a rather delicate beer but the peaches add a beautiful accent to an otherwise solid and balanced wild ale. I find it incredible that this was produced in a single barrel whereas a blend of several barrels is often required to create something with this level of balance and complexity. Everyone really enjoyed Interlude because, well, it’s Interlude. This kind of beer is right in Mrs. Mash Tun’s wheelhouse, save for the 10.6% ABV (which I still believe is a misprint; there’s no way they cram that much alcohol in a beer this smooth). Barb comes from the land of Russian River, Almanac, and The Bruery. We agonized over what to bring that would exemplify the best beers being made in Portland while also appealing to her sophisticated preference for sour ales. Her reaction to our curated Portland beer selection was muted, but generally positive, which is sooo Barb. The next day, Mini Mash Tun and I went to check out the pool. It was closed the day we checked in, which at the time sounded like an almost certain disaster given how much we had been talking it up in order to get her excited about spending four hours in the car. The official reason for closure was “damage” to the pool, which I think is code for, “poop”. The water looked murky when it was finally reopened and there was enough chlorine that my eyes stung just walking into the room. Nevertheless, a pool was promised and I refused to let a budget motel make a liar out of me. Mini had a blast while I did my best not to dry heave as I accrued quite a collection of hair floating around us like so much seaweed. After some thorough showering, we met Mrs. Mash Tun for lunch at Northampton Brewery Bar + Grille. It’s a thoroughly modern-looking brewpub with a standard menu of burgers, pizza, and salads. They offer half-pours which is always appreciated. Between the two of us we had an ESB, an Old Brown Dog, and a Black Cat Stout. Each was serviceable and neither of us regretted our options. For dinner, Mrs. Mash Tun, Micro Mash Tun, and Barb were out painting the town red while Mini and I were on our own. We stopped by a package store on our walk back from a pizza parlor and picked up some Kiwi Rising from Jack’s Abby (and a complimentary Dum-Dum for Mini). The beer is billed as a double IPL hopped with four pounds per barrel of exotic New Zealand tropicaliciousness. This beer is heavy-handed in every way possible, but it was exactly what I was looking for and I drank them with gusto. Our intrepid trio made it home around 21:30 and picked up a six-pack of Jack’s Abby’s House Lager to finish the party. This allowed us the opportunity to compare Honeycrisp to Fuji, so to speak, as I had brought some Back Cove with me just in case drinking supplies ran short. While similar, the agreed opinion was that Back Cove had a more pronounced bitterness and was a bit rougher around the edges than the hellesbier we were comparing it to. 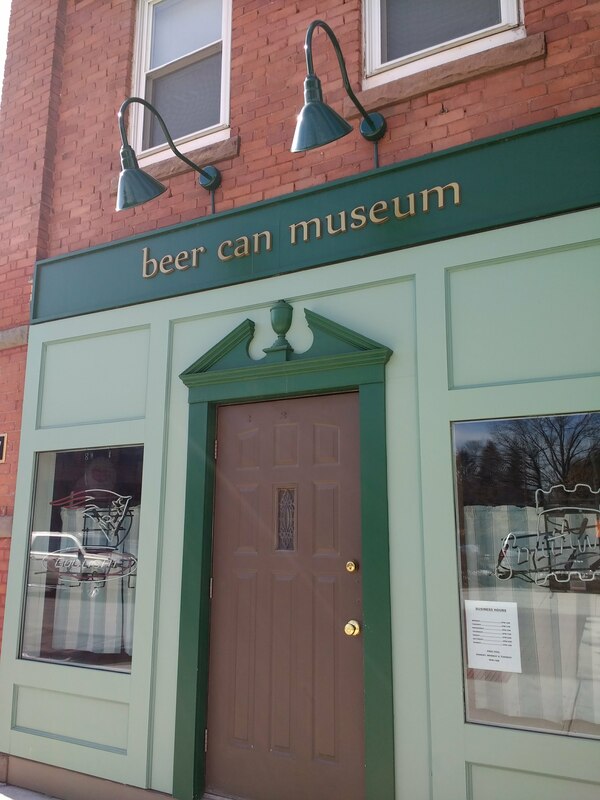 Not a beer can museum. Our last morning in NoHo led us to a surprisingly awesome stop at the deceivingly bland-sounding Northampton Coffee. Great coffee, cold brew on nitro, crosswords on the table, and friendly patrons. It has the added benefit of being next to a beer can museum (pro!) which turns out to be just a bar (con!) but it IS a bar with plenty of old beer cans on display (pro!) I’m getting too old to handle these emotional swings. We hung out on campus for the afternoon and had lunch at the Campus Center, which was looking a little worse for the wear considering it was brand new when we were students. We had lunch among a couple hundred students smack in the middle of Rally Day. 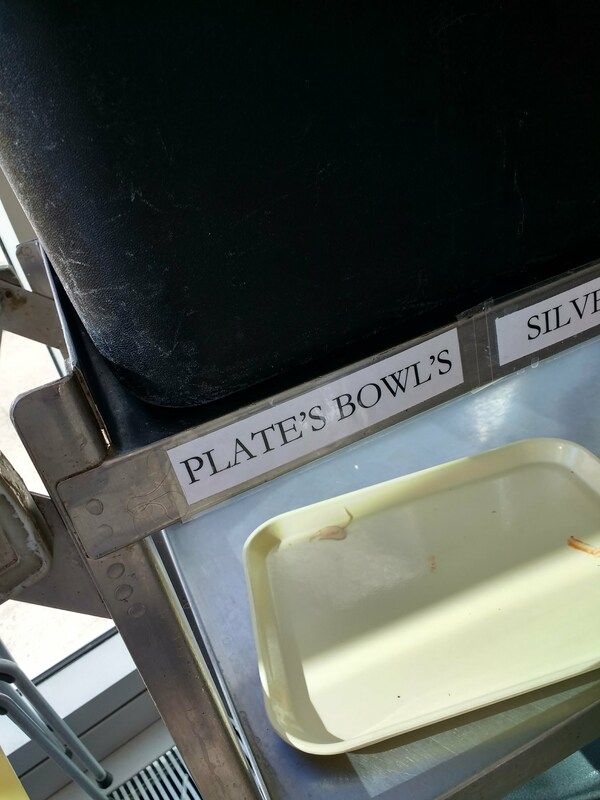 Food was slightly elevated Cafeteria but I was more disappointed by the signage then the menu. C’mon Smith, I expect better. 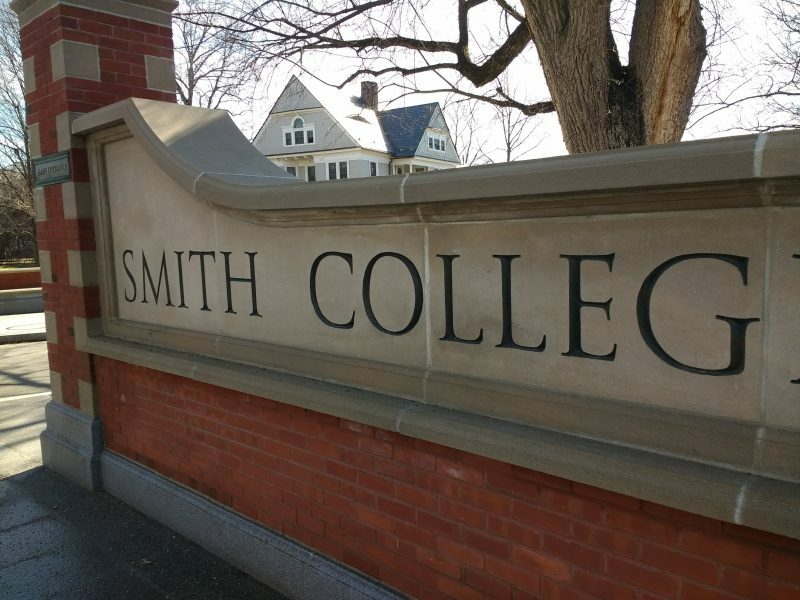 It was undeniably fun to be back in town after so many years but I couldn’t help but be reminded by how thoroughly I had squandered my own collegiate opportunities. Also, as I sat there with my family of four, and with a friend we’ve known for over fifteen years, surrounded by young adults who are closer in age to Mini Mash Tun than myself, I mostly just felt old. We had plans to have dinner at yet another brewpub, but a freakishly warm and sunny day delayed our departure from Northampton to the point where a formal sit-down meal seemed like an impossibility. Instead we grabbed Five Guys in Leominster. Decent burgers. Great fries. No beer.